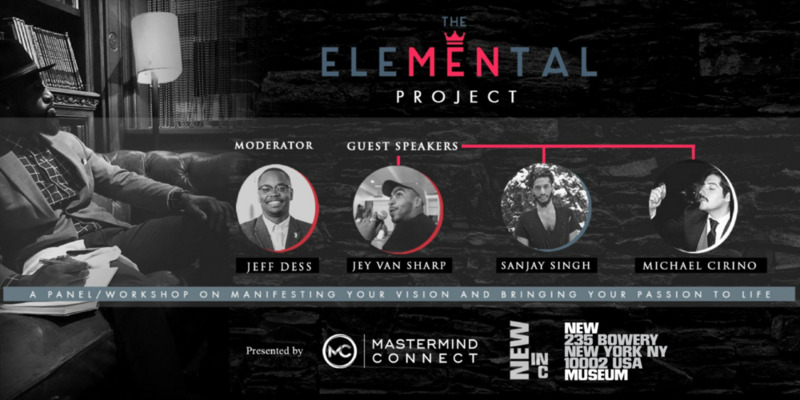 On April 29th, from 1pm to 4pm, Mastermind Connect men's group will be launching The eleMENtal Project: a series of informative panels and workshops designed to challenge today’s man. Our first panel will be about "MANifesting your Vision and bringing your passion to LIFE". The event will be held at The New Museum's (New INC) space and after the panel we'll be holding accountability workshops to help you bring your vision to life. We have secured four amazing panelists from different fields, who run unique businesses. We will be discussing building your personal and professional brand, executing more effectively and how to bring your idea to life. Principal Owner @MyÜberLife Consulting Group. Jey advises and grow businesses, and specializes in the business of culture. Jey is also a professor, helping business-minded people become more creative and creative-minded people become more business focused. Sanjay is a multi-disciplinary artist and founder of the NuKhu international media production and distribution network. He is also the owner of SANJAYVISION, a lifestyle brand. Principal Owner of A Razor A Shiny Knife. Michael throws the most elaborate dinner parties in the world from a six course dinner on the L train, a 100 course meal, and more. Michael has worked with some of the biggest luxury brands in the world. An independent curator, cultural producer, social sculptor, and entrepreneur, Rasu currently serves as the Director of Cultural Diversity and Strategic Partnerships at NEW INC, The New Museum’s creative entrepreneurship incubator for art, tech, and technology.